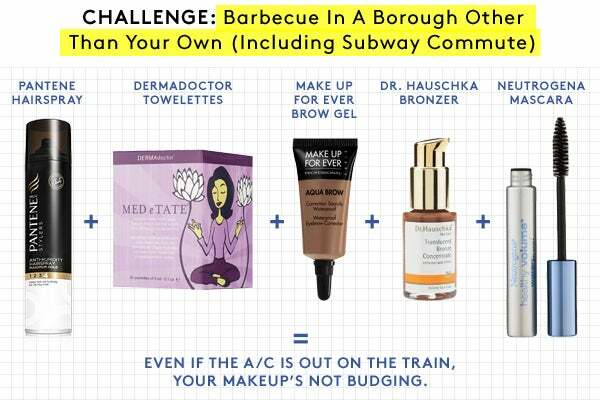 When the mercury skyrockets past 80 degrees, applying your regularly scheduled makeup becomes its own special project. Textures and color fastness have to be taken into consideration, lest the results resemble the cosmetic equivalent of layering butter on top of extra-virgin olive oil. Similes be damned: To paraphrase the musical stylings of Martha and the Vandellas, it’s not like a heat wave — it IS one. 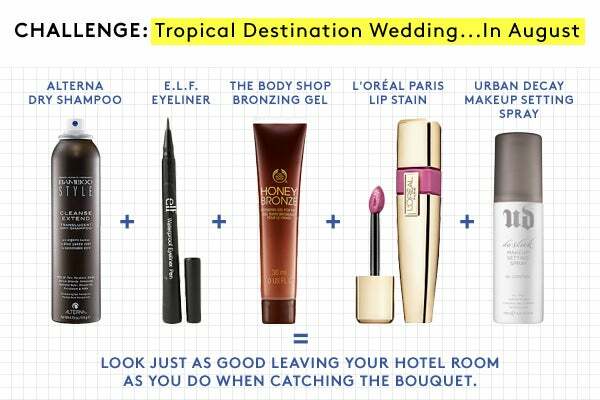 Here, our picks to keep your beauty products’ effects from exiting stage left. Maybelline Baby Lips Moisturizing Lip Balm in Oh! Orange, $3.99, available at drugstore.com; CoverGirl Flamed Out Eye Shadow Pencil, $5.99, available at Target; NARS Brow Gel, $22, available at NARS Cosmetics; Talika Skin Retouch, $49, available at Nordstrom; W3ll People Stick in Universalist 5, $33, available at W3ll People. Alterna Bamboo Style Cleanse Extend Translucent Dry Shampoo, $22, available at Sephora; E.L.F. 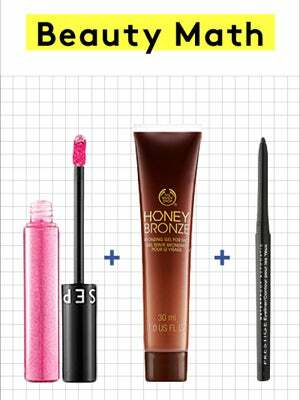 Waterproof Eyeliner Pen, $1, available at drugstore.com; The Body Shop Honey Bronze Bronzing Gel For Face, $14, available at The Body Shop; L’Oreal Paris Colour Riche Caresse Wet Shine Stain, $9.99, available at drugstore.com; Urban Decay De-Slick Oil Control Makeup Setting Spray, $29, available at Macy's. 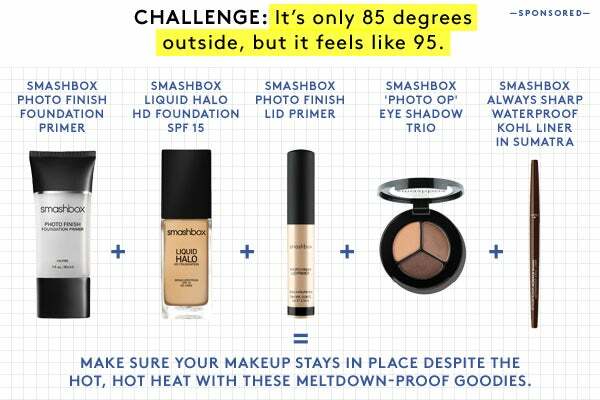 Smashbox Photo Finish Foundation Primer, $36, available at Smashbox; Smashbox Liquid Halo HD Foundation SPF 15, $42, available at Smashbox; Smashbox Photo Finish Lid Primer, $20, available at Smashbox; Smashbox 'Photo Op' Eye Shadow Trio, $28, available at Smashbox; Smashbox Always Sharp Waterproof Kohl Liner in Sumatra, $20, available at Smashbox. Pantene Pro-V Anti-Humidity Maximum Hold Hairspray, $5.13, available at Amazon; DermaDoctor Med E Tate Sweat Control Towelettes, $48, available at DermaDoctor; Make Up For Ever Aqua Brow, $20, available at Sephora; Dr. Hauschka Translucent Bronze Concentrate, $39.95, available at Dr. Hauschka; Almay Color + Care Liquid Lip Balm, $4.99, available at Target; Neutrogena Healthy Volume Mascara, $7.99, available at Ulta. 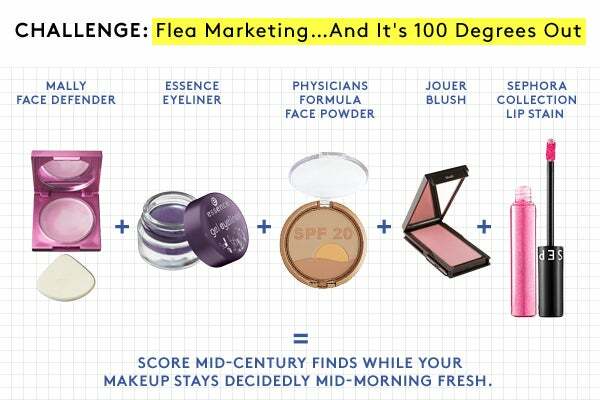 Mally Face Defender, $40, available at Ulta; Essence Gel Eyeliner, $5.99, available at Sears; Physicians Formula Solar Powder SPF 20 Face Powder, $12.95, available at Physicians Formula; Jouer Mineral Powder Blush, $24, available at Nordstrom; Sephora Collection Cream Lip Stain, $12, available at Sephora. 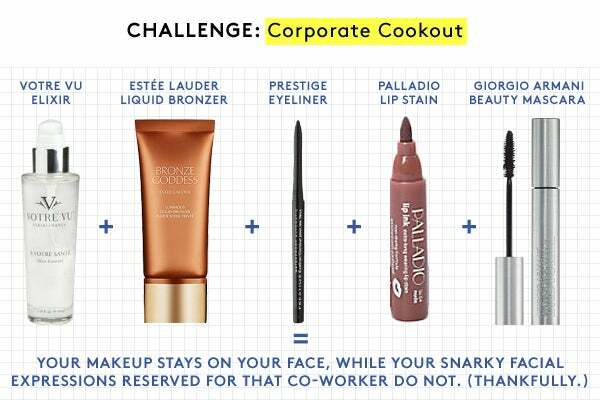 Votre Vu À Votre Santé Elixir Essentiel Elixir Essentiel, $20.30, available at Votre Vu; Estee Lauder Bronze Goddess Luminous Liquid Bronzer, $29, available at Estee Lauder; Prestige Waterproof Automatic Eyeliner, $4.20, available at drugstore.com; Palladio Lip Stain, $6.49, available at Sally Beauty; Giorgio Armani Beauty Eyes To Kill Waterproof Mascara $30, available at Giorgio Armani Beauty.